Mel Lyne is a national treasure and belongs to British Columbia. There are few who can match his conceptual designs and fewer on his excellent follow through. A few years ago, Mel endeavored to help Caroline McPherson learn to fly control line AND to be able to enter Vintage Diesel Combat. All things considered, Mel built to his own specifications, two versions of the Old reliable Dominator. Covered in Fas-cal and fitted with Sharma's Mel sent two of the innocent looking models to Jeff Rein for Caroline to learn on. Caroline, while filled with confidence but no experience approached flying like archery, that is hang on with as much grip as possible, this caused several air to earth incidents that caused many of us to cringe at the sheer magnitude of impact. The Dominator suffered not even a scratch. As she learned control, the crashes became fewer and thus Caroline entered contests. More crashed occurred as she now was getting used to flying in a match, doing maneuvers and all sorts of things that we take for granted. The Dominator remained undamaged. Fast forward over a year or so and Jeff was working with her again to get ready for the next contest season. This time, better but still crash prone as a part time flyer, Caroline forged ahead working on more maneuvers and finding new ways to bury the formidable British combat wing. At one point, Jeff thought there might be something wrong with the wing and flew it on a windy day. He did the entire AMA stunt pattern with no problem. The following year, I asked if he ever had to rebuild either of them. "No,not yet," he said. "How many crashes do you suppose they have taken?" "About 50," he said. We just looked at each other, thinking the same thing. The Dominator without using any carbon fiber or slick material just didn't break! It flew fast and well, maybe not as well as some, but in the wind there was no equal. In learning how to fly combat, Caroline had done what no one else would have imagined doing, she tested the durability of this design to its limits. In 2009, the last D-Bat contest was so windy that most all airplanes were uncontrollable, most, but not all. The Dominator would fly pretty well, and did not have the same problems as others including builder, Mel Lyne, who said "I should have used one of those things." I began wondering out loud, how Mel could make such an indestructible combat wing that still performed. We found the answer in some of the building techniques and some in the design. The design has a swept back leading edge, this really helps in the straight in crashes, the thoughtful bracing and wood selection along with simplicity of the center rib and its bracing gave us the other reasons. We each endeavored to make a fleet of the stubby little vehicles. 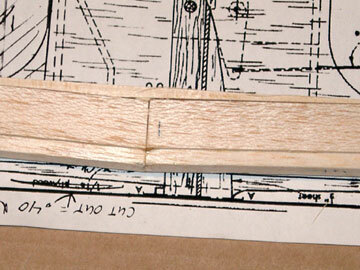 Jeff had a supply of cedar leading edges that he had routed a couple of years back, and began right away in making his. He used the bass type engine block with _ x 3/8 spruce ala F2D style to make the same center rib that Mel had used on Caroline's. 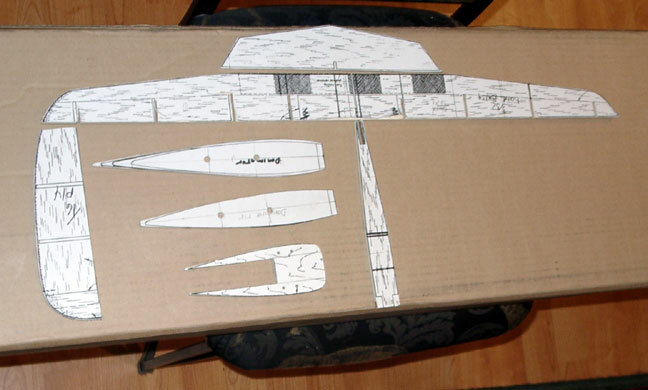 Rib templates were supplied by Mel and are basicly Voo-Doo style airfoils of different length. 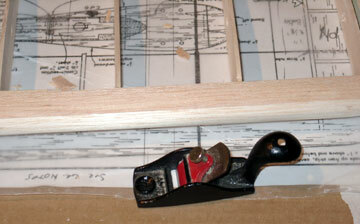 This combination works great and usually is in conjunction with a 1" thick leading edge. Jeff's were smaller at _" but we thought that would make little difference. About a month later, there were four beautiful Dominators sitting on the bench waiting to test fly. The test session was a dead calm day in January. The Dominator flew very fast and pointed out when going into turns. Jeff added tail weight and it seemed to improve a little but still pointed out too much for calm air. A trip to the shop moved the lead-outs forward a bit to help with the condition. Mean while I started on my stack of stubby combatiers. I had decided to try a different idea here and there, usually a mistake. 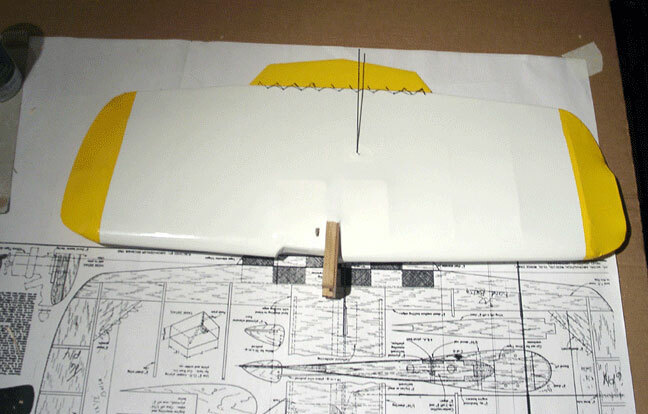 I used a 1" solid center rib that is flat 1" with full size airfoils glued to each side for maximum lift at the center section. The 1" wide flat makes the motor mount detail much easier to manage than if it is airfoil shaped. The ribs I used are tapered largest to smallest by sandwiching the rib blanks between two templates and sanding to the smaller airfoil. To hold the ribs in place while sanding, I drilled two corresponding holes in the templates, then drill through the blanks and pin the blanks with dowels to hold all in alignment. 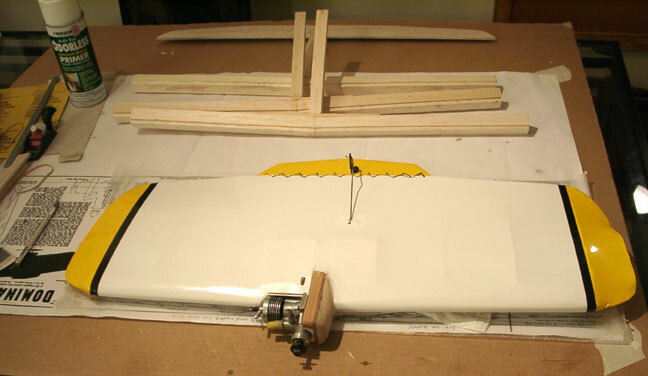 The leading edge is also 1" x 1" blasa and helps in building the airplane without a jig. 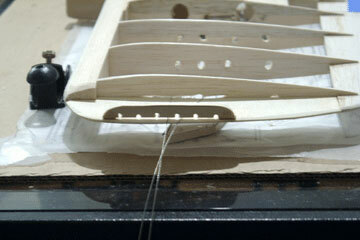 A jig however is without a doubt the best way to make anything. 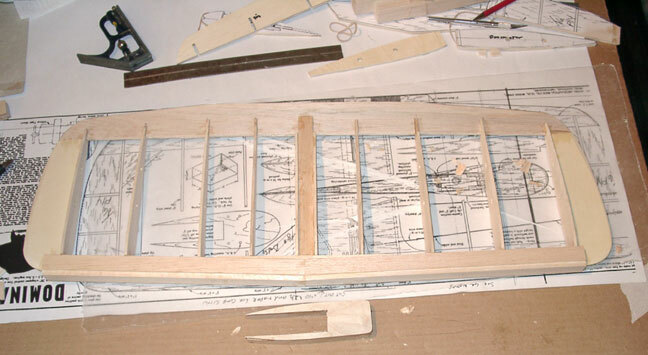 The elevator is made from 5 ply 1/8" plywood to give it the needed tail weight. Other than that, both are the same. Plans for the Dominator are available from Barry Baxter's Control-Line Plans Service. I have included a spreadsheet of the parts and costs I used to construct four airplanes. With covering and all, they were about $18.00 each. Jeff and I spent most of a flying day testing and comparing the two Dominators. Mine seemed to be a bit snappier and would turn tighter before reaching a stall point. 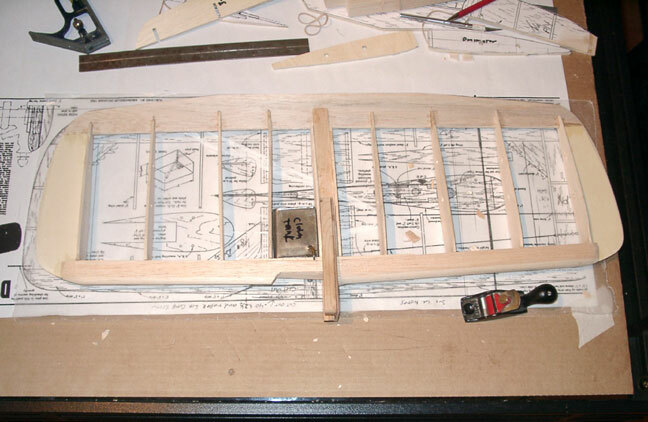 Jeff added tail weight and wingtip weight to compensate, but it did not make a significant change. If anyone has noticed how Mel flies D-bat, he's usually not trying to out turn his opponent, but rather uses the full speed in his loops, uses a few extra and is right back behind you. This is what Jeff had created. Unless it is over controlled, his version runs smoothly and fast through consecutive loops, corners well and flies in the wind perfectly. My version of the Dominator does all that with a slightly snappier cornering and somewhat tighter loops. We both attribute this to the more blunt leading edge and increased center airfoil. The dominator that I built will do overhead figure 8's up wind with no problems. What's it all mean, Kenny?! The long and short of this means that with a Dominator, you have a good, not great, still air combat wing that won't break. In windy weather you have a great, not good, combat wing that won't break. Consider that most of the time the wind is blowing, while at Chehalis where we fly D-Bat, it's always blowing. This airplane is an advantage that may take some adjustment in flying style to use constant speed and not super tight turning that usually bogs down the engine anyway.